Ed Notes Online: Substance: News analysis: Is CORE founder Jackson Potter's power starting to fade? Substance: News analysis: Is CORE founder Jackson Potter's power starting to fade? His eloquence and brilliant mind on display during the board meetings resulted in former Chicago Public Schools (CPS) Chief Arne Duncan, who later became Obama's education secretary, to remark that he wanted Potter to work for him. Nobody worked harder than Potter to make CORE the leader of the CTU today. He began passing out flyers, organizing meetings and perhaps most importantly, understanding the role politics would play to inspire teachers to fight for a new union. Jim Vail, who I've met a few times, dissects the role Jackson Potter has payed. Jackson has had enormous influence over the past decade as the key organizer of CORE. He always seemed like a political genius and at one time was a close associate of the late George Schmidt. CORE won the election to run the CTU in 2010 and we all got to hang out together at the AFT convention in Seattle a few weeks later, where the CTU delegates pushed back against Randi and Unity on certain issues. By 2012 when there were about to strike, they had pulled back from challenging Randi because they bigger enemy was local. By 2014 they were totally in Randi's fold. I first met Jackson in July 2009 when I went out to Los Angeles to a meeting of people from around the nation organized by Sally Lee of Teachers Unite, Jackson and Alex Caputo-Pearl, then a member of the UTLA Ex Bd and now president of the LA union and soon about to go on strike. I tagged along with Jackson and other CORE people for breakfast at Alex' home one Sunday morning and listening to Alex and Jackson discuss the issues related to organizing was like sitting at a championship tennis match. Jackson was visiting NYC a few years ago and biked out to Belle Harbor to hang out and talk. He is one of the most interesting people I've met. The last time I saw him in Minneapolis in the summer of 2016 at the AFT convention he invited me to lunch with a bunch of CTU staffers and others and introduced me as the George Schmidt of NYC - I could see some roll their eyes --- 8 months ago an attempt was made to purge George from CORE by certain ideologues. CORE may be opposed by another caucus for the first time since they won in 2010 in the elections this May. The Coalition of Rank & File Educators (CORE) took the country by storm in 2010 when they became the new leaders of the Chicago Teachers Union and then led an historic teachers strike two years later. The CTU red inspired teachers all across the country to also go on strike. While CTU President Karen Lewis was the face of the union that rose to national prominence - there was another individual who the public knew little about but also played a very big role. never win and take over a $25 million operation. Jackson Potter is the architect, founder and inspirational leader of CORE who made all this possible. And he did it by keeping his name off the front pages. He appears more comfortable operating behind closed doors even though he along with other early CORE members were a headache at Chicago Board of Education meetings by speaking out against Mayor Richard Daley's privatization plan called Ren 2010 to close public schools and open charters. "You're giving me a choice," Potter said at one board meeting, ridiculing the idea of school choice. "I can either cut off my right hand, or my left foot." His eloquence and brilliant mind on display during the board meetings resulted in former Chicago Public Schools (CPS) Chief Arne Duncan, who later became Obama's education secretary, to remark that he wanted Potter to work for him. Nobody worked harder than Potter to make CORE the leader of the CTU today. He began passing out flyers, organizing meetings and perhaps most importantly, understanding the role politics would play to inspire teachers to fight for a new union. He was supposed to be the first CORE vice president candidate in the historic 2010 CTU election where five teacher caucuses ran. However, the UPC challenged his candidacy due to a teacher sabbatical he had taken and he was forced off the ticket. But he still ran the show behind the scenes. CORE won the election because the UPC was split after president Marilyn Stewart fired her vice president Ted Dallas, who formed his own caucus and split the vote. CORE won in a runoff because former CTU president Debbie Lynch backed CORE. Potter became the union's chief of staff - though he called himself a staff coordinator - which sounds like a regular employee. But he along with the officers were calling the shots. CTU politics today have been molded by the hands of Jackson Potter. He first hired his mother and her law firm to handle union work. While his mother is considered a brilliant legal mind, the raw nepotism of hiring family members was never challenged until recently when newly formed caucus Members First started questioning this at delegates meetings. While many protests were organized by the union, culminating in the historic teachers strike in 2012, Potter balanced this social justice unionism by forming a very pragmatic political alliance with the city machine. The CTU was able to beat its chest loud and clear in the murky world of politics when it sold the Fewkes Tower for about $50 million a few years ago. The union then purchased its current headquarters at Damen & Carroll for about $8.5 million, and the rest of the money was put into a foundation. While the foundation is controlled by the CTU officers, it is not under the control of the CTU delegates who must vote on a union budget each June. The money has been used to renovate the building, and pay union employees, as well as finance a political agenda closely aligned to the Chicago political machine. But this murkey world of foundation money, financing political candidates unbeknownst to the members and other behind-the-scenes deals have finally caught up to the architect of it all - Jackson Potter. One former UPC operative said CORE could never win and take over a $25 million operation. Surprise! 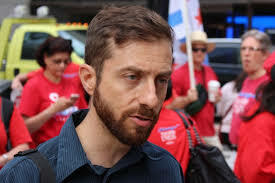 In what was hailed by insiders as a heroic move to deal with CTU budget woes that resulted in overspending $5 million, Potter agreed to move from the union back to the schools and is now teaching at Back of the Yards High School. While his move may have been hailed as saving the union perhaps more than $150,000 in compensation - including salary, benefits and pension - his power within the union was to continue. However, the CORE star and founder is suddenly under attack. His first challenge was when he presented himself as a candidate to become a CTU trustee on the CORE ticket. He was defeated by CORE member and high school math teacher Drew Heiserman, who was presented as the CORE-endorsed candidate who delegates voted in favor of. This perhaps was the first official setback for Potter. This was definitely a big political upset. Potter then had a close call to become CORE's high school functional vice president to serve on the CTU Executive Board. He beat Francine Reizen in a close vote with 71 votes (56%) to Reizen's 56 votes (44%). The man who organized and led numerous social justice marches, including getting arrested when protesting a car dealership getting TIF money while schools budgets were slashed, is suddenly losing control of the ship he built and captained for the past decade. To understand the power of Potter - think of it this way. There is President Obama, and there are the people who put him in power because of their money and expertise. These are the people who really run the show. Karen Lewis and Jesse Sharkey were put into power courtesy of Potter. He invited Lewis to join his caucus and made sure she got elected to the steering committee to run it. He gave his blessing for Sharkey to serve as Karen's running mate, and eventually replace her as CTU president. He also began his political plan by naming former colleague Stacy Davis Gates as head of the political department. She is now the union's vice president. So why now the sudden shift in winds? As many say, it's all political. The anger many have felt about the union's inside deals being engineered by Potter and others resulted in the formation of a competitor to run the union - Members First. Members First and its president Therese Boyle have been questioning the CTU's murkey finances, namely the Foundation spending. The $5 million budget shortfall was perhaps the straw that broke the camel's back. Until there is a factual and reviewable, in-print statement as to how CTU/CTUF actually spent over 5 million dollars in CTU reserves in less than three years, the leadership of CTU should be under heavy scrutiny. Jim Vail presents an intriguing portrait of Jackson Potter who has always worked hard for his money. I think this piece credits him with more power than he's had in that any powerful and successful political movement like the present CORE leadership in the CTU will have way more than one smart Machiavelli (sp?. And yes, there must be accountability and transparency with any money the union spends--and a democratic vote in the House of Delegates.